Do I have an account with UAS? Your student account becomes available as soon as the registration process is completed. Please note that registration is considered "completed" when your information is entered into the University of Alaska's Banner Registration system - not when you submit your paperwork. This is true even if your application is submitted online. To activate your new account you will need to find your username and set a password in ELMO (Easy Login Maintenance Option), also referred to as Login Help. While account activation allows immediate access to most UAS resources, it can take up to 24 hours for your class discussion boards to become available. What is my UAS username? Your UAS Username is a unique identifier automatically set up for you when you register for UAS courses. The username will be used with UASOnline, Email, campus computers, and more. To find your username, please visit the ELMO (Easy Login Maintenance Option). What is my UAS password? To set your initial password, as well as reset a forgotten password, please visit ELMO. ELMO shows that my username is expired? Your account will expire if you stop taking classes for a semester or more. If you sign up for new classes your account will be reactivated when the registration process is completed. Please note that registration is considered "completed" when your information is entered into the University of Alaska's Banner Registration system - not when you submit your paperwork. However, if you register online as a previous student, account reactivation is immediate. If you believe your account should be active and ELMO shows it to be inactive, please contact the Helpdesk for assistance. If you are not currently enrolled but completing coursework from a previous semester, please contact your academic department to arrange an account extension. While account activation allows immediate access to most UAS resources, it can take up to 24 hours for your class discussion boards to become available. Did you know it is possible to view course sites and syllabi before you register? Simply visit UASOnline and search for classes in the Course Homesites box. Accounts remain active until 8 weeks after the last day classes for which you are currently registered. This gives you time to move needed materials, notify contacts of an address change, et cetera. When you sign up for new classes your account will be reactivated when the registration process is completed. Please note that registration is considered "completed" when your information is entered into UAS internal systems, not when you submit your paperwork. However, if you register online as a previous student, account reactivation will be immediate. If you pre register for the next semester, as many students do, your account will remain active throughout your time at UAS. In order to extend an expired account refer to the options listed on the Account Extensions page. Where will I receive UAS emails? Every account created at UAS is given a UA Google email address: username@alaska.edu. This is your official email address for University activity. How do I access UA Google? UA Google webmail can be accessed from the MyUAS ribbon at the top of every UAS webpage. To will automatically connect if you are already logged into the Single Sign On or prompt you if you are not authenticated. You can also connect by going to UA Google. Configure Outlook to connect to UA Google. See the UA Google Access section for more information. Set up an alternate Email Client. See the OIT Supported Clients page for more information. How do I receive email at a different (personal) email address? UA Google is the standard email, accessible at http://google.alaska.edu. Other will redirect to any other account you enter (personal email address). How do I unforward my email account? 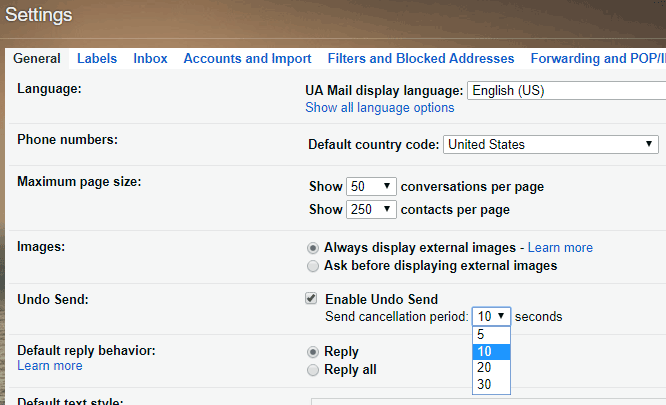 In ELMO, simply change your Email Destination to UA Google. This will change the redirect to UA Google, instead of a personal account. I'm new to this job and my department uses Outlook. How do I add my Google Email to Outlook? First, run the Google Suite Sync tool. Go to the Start Menu > All Programs > G Suite Sync > Set up G Suite Sync user. If you do not see google apps sync, download it here: G Suite Sync. Enter your UAUSERNAME@alaska.edu and click Continue. Click Allow when prompted in your browser. Click Create Profile (if you choose to migrate content off the old Exchange server, visit the Exchange (Legacy) section for instructions). When completed, you will be prompted to select a profile when Outlook opens. By default, this is named "USERNAME@alaska.edu - Google Apps." A Synchronize Status window will appear, displaying the status of Outlook connecting with the Google server. This may take some time, depending on the amount of email present. I'm a Mac user. Can I connect to Google from my Mac? Yes. Mac Mail (or Stamp Mail) is the recommended client for accessing your Google mailbox on a Mac. Go to the Accounts tab across the top of the window. Sign in with your UA credentials. How do I get access to a department email account? Access to department email accounts is typically managed through the Group Security Manager tool. Ask your department's admin assistant about who manages that email account. How do I connect to a shared email account? Once you've logged in to Google webmail, you can access any delegated accounts you have access to by clicking your profile button in the upper right (by default, an image of your first initial). This will populate a list of all of the delegated accounts you have access to. If you do not see one on the list, please contact the email account manager and confirm both that you have access, and that the account has been migrated. After configuring Google Suite Sync in Outlook, you can add additional delegated accounts through GSSMO. The delegate account will now be added to your Outlook Profile. How do I add an auto-reply or vacation message to my email? To remove Auto-reply or Vacation message, simply click the button to turn Vacation responder OFF. How do I change my UAS email password? Email passwords are the same as any other UAS password. To change your UAS password, go to Login Help (ELMO) and reset the password for all your UAS computer accounts. How do I use LDAP to look up UAS & UA addresses automatically? To have your email automatically know the recipients address with only typing their name, you’ll need to be connected to the LDAP server. Here are the steps to connect to the UAS and UA Statewide LDAP services in Outlook. It is not currently possible in Google Webmail. Open your Outlook Google profile. 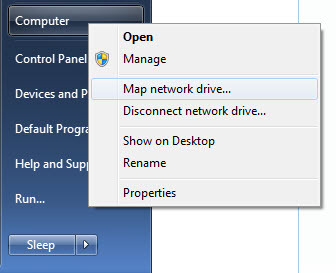 Select the File menu at the top of your window. In the Account Settings window, select the "Address Book" tab, then click "New..."
Choose "Internet Directory Service (LDAP)", then click "Next" at the bottom of the window. Click "Next" at the bottom of the window. Why aren't Outlook and Google synchronizing? Any change made either Google or Outlook will need to synchronize before it shows up on the other side. If Google Apps Sync is in the middle of a large batch of synchronizations, this may take some time. We recommend making all of your settings changes in Google, as not all changes in Outlook will spread to Google. In the event Outlook is taking too long to sync, close the program and reopen it. How do I see my Google Contacts? This page lists all of the contacts created by your account. If you migrated from Exchange, you may have many duplicate entries. Unfortunately, some contacts may be lost during the migration process. You will need to rebuild these contacts manually. I've received an email, "Delivery Status Notification (Failure)" or "Undeliverable," What does this mean? These "bounced back" email errors occur when messages can not be delivered to an email account. This message will usually explain why the message was undeliverable and who the recipients were. If this is not clear, please forward the message as an attachment to the Helpdesk (uas.helpdesk@alaska.edu). We will be happy to help resolve the problem. To forward a single message as an attachment, go to Message > Forward as... > Attachment. What email addresses can I receive messages at? Students will want to use the syntax of username@alaska.edu as the address to give out. Employees will be given a username@alaska.edu and first.last@alaska.edu alias that will be received at their primary Email Destination and in their UA Google inbox. Personalized email aliases can also be created in ELMO: log into ELMO's alias page. From here, review your alias options, and click the Activate button for any you would like to use. If there are additional addresses you would like to use, please contact the Helpdesk. Please note: once activated, these aliases will be permanently assigned to your UA email account. Users with existing ﻿username@uas.alaska.edu﻿ accounts will still receive emails sent to these addresses. Employees with existing first.last@uas.alaska.edu vanity addresses will also receive mail sent to this address. Initially, these addresses are configured as their names are stored in the university information system (Banner), but can be altered to fit preferred names (Tom vs Thomas, etc). Please contact the Helpdesk for information about configuring this setting. Google Mail recognizes that the incoming message is identical to the copy in your Sent Items and ignores the duplicate. This is a part of Google's threading feature in the web client when you post a reply, your reply is threaded in with other's responses. This is a system feature and can not be disabled. Google doesn't display my name correctly. Why? UA Google doesn't actively update from the directory. It needs to be updated directly, and this will occur when a Username Regeneration request is placed in UA Online. Please note that doing this mid-semester can interfere with active courses. Google has unlimited space. However, messages are limited to 25 Mbs each. If you need to send larger attachments, you can use Google Drive. If Google detects an attachment that's too large, it will automatically use Drive. How do I allow other people to access my email? You can grant other people access to your Google email inbox. Please be aware that this grants them full control over your account. Locate “Grant access to your account”. Enter the other individual’s @alaska.edu account. Click "Send email to grant access". An email confirmation will be sent to their account. Upon the other individual clicking the confirm link, there is up to a 30 minute processing time. How do I allow other people to add things to my Google Calendar? You can share your Google calendar with others and designate the level of access from view only to full access. Click the Google Apps icon in the upper right. Under Share with specific people, enter the person's email address (e.g. username@alaska.edu). Select the appropriate level of Permission Setting. Repeat steps until all people are entered. Please also review the "Share this calendar with others" setting. What if I have second thoughts about sending an email? Can I take it back? Google has a tool that allows you to delay outgoing messages. This means that after you hit Send, you've got a frame of time to cancel the message and make changes. From your Google Settings, under the General tab, check the Enable Undo Send box. You can customize how long Google saves your message: 5, 10, 20, or 30 seconds. How can I see sent emails? When sending from Webmail, sent messages are automatically saved to the folder Sent Items (Exchange) or Sent Mail (Google). How do I stop my emails from stacking together? Google's Conversation View is designed to keep all emails on the same subject together. It does this by filtering up to 100 email with the same or similar Subject lines into one Conversation. This can cause difficulty if you have similar conversations at the same time. What is spam, and how can I remain safe against it? Spam refers to unsolicited emails with the intent of gathering information from the recipient. It may come in the form of advertisements, personal requests, solicitations, offers, prizes, or a myriad of other options. If you don't know if an email is sincere, ask. Your coworkers and the Helpdesk may be able to guide you. Always check the sender and recipient information on suspicious emails. Spam may have strange or false email addresses listed. Don't provide confidential information through email, if it can be avoided. Never reply to a clearly fraudulent email. This gives the spammer information about you. Never click "unsubscribe" unless the message is from a trusted source. This gives the spammer information about you. How do I release mail marked as spam? To release a legitimate message marked as spam, drag the message from the Junk/Spam folder to your Inbox. You can add the sender’s email address to your list of “Safe senders." In webmail, select the spam message(s) and click the Not Spam button. How long is junk mail maintained for? Mail in your Junk folder will be automatically deleted after 30 days. Will my current @uas.alaska.edu email address still work? Yes! Existing @uas.alaska.edu addresses will now forward to your preferred mail address, defaulting to UA Google. What about my Exchange mail and calendar info? You have the choice of migrating your existing data if you so desire. Google provides a tool to help Outlook users migrate and synchronize their data. Mac Mail can be used to migrate mail content. It migrates your Exchange data to your Google account. It creates a new Outlook profile to your Google account. It downloads a copy of your Google mail/calendar data to your local hard drive and uses it to synchronize your Outlook client with your Google account. Do I have to use Outlook for my mail client? No. Google Apps can always be accessed through the Google Web pages by visiting UA Google. Can I still use Outlook? Yes. Existing Outlook users will be able to continue to use Outlook to access their Google account. There will be a change to some functionality. Can I still use Thunderbird? Yes. You will need to configure a new Thunderbird profile that connects to Google. Visit the OIT Desktop Client Instructions. How do I connect back to the old Exchange server? You may find yourself needing to access the UAS Exchange server to access a shared departmental mailbox or calendar. Option 1: Use the OWA web interface by connecting to https://mail.uas.alaska.edu. Option 2: Outlook Users: If you used the Google Suite Sync for Microsoft Office (GSSMO) migration tool, it created two profiles: one to Google and one to the UAS Exchange server. To connect, quit Outlook and relaunch. When prompted to select an Outlook profile, select "Outlook" instead of "Google Apps." Please note: Content will no longer be accessible once the server has been shut down, though the date of this has yet to be determined. How can I connect to a departmental email account? where "SHARED-ACCOUNT" is your shared account email address. Click on the Add button, enter your shared email account ("helpdesk", "admissions", "career services", etc.) and then click OK.
Click next and finish to close the wizard to return to Account Settings panel. How long will my old content be available in Exchange? Content will no longer be accessible once the server has been shut down, though the date of this has yet to be determined. Are departmental email accounts, room calendars, etc still accessible? ITS has migrated active Exchange accounts and calendars over to UA Google. If you have an account you would still like migrated, please contact the UAS Helpdesk. Can I continue to access my voice mail through my Google e-mail? Access to voicemail has changed in the Google environment. When you receive a voicemail, it will be placed in your http://uas.alaska.edu/pub/voicemail, and you will receive an email notification with the voicemail attached. Voicemails in the Cisco Inbox will clear after two weeks. Voicemails in the Google Inbox can be retained in a similar manner to any other email. Active distribution lists have been migrated to UA Google. If you have a distribution list you would still like migrated, please contact the UAS Helpdesk. Where did my Out of Office Assistant go in Outlook? Outlook's Out of Office Assistant feature doesn't work with Google Suite Sync. You can still set your vacation reply by visiting your Google settings. How do I access Google resources? Google applications can be accessed in several ways. On the main UAS website, log into the menu at the top of this page and either select my Email from the personal menu, or clicking the pop-up menu ( ). Go straight to your UA Google inbox at google.alaska.edu. How do I set my status to unavailable, so that I can work anonymously? UA Google accounts have to be considered active at all times, in order to better manage workplace accountability. In the left navigation bar, locate the calendar you wish to share access to. Click the arrow beside the calendar. Under Share with specific people, search for the person. Select the Permission Settings you want to grant them. Resource Calendar access is managed through the Group Security Manager tool, but calendars can be set to public so that people within the university can access free/busy content. How do I access different calendars? You can see the calendars you have access to through Google Calendars. On the left navigation bar, you can see My calendars as well as Other calendars that have been shared with you. You can use the search field in Other calendars to add additional UA Google calendars, such as calendars for coworkers and Resource Calendars. You can search these calendars either by name or email address. By default you will be able to tell when a calendar is free or busy, without any details about specific events. If you are using Outlook, it will match your currently available calendars next time it synchronizes. How do I invite people to an event through Google Calendar? When you edit an event in Google Calendar, an option to Add guests appears on the right. Enter the name or email address of the people you wish to invite and click Save. You will be asked if you'd like to send invitations to guests. They will receive an email to confirm their attendance. They can choose Yes, Maybe, or No, and will automatically be added to their Google Calendar based on their answer. You can confirm their status by looking at the event in your own calendar. How do you color code different events? When editing a specific event, you can select from Googles color options in the Event color field, with the first color being the default for that calendar. You can customize each calendar in the Calendar Settings drop-down menu with a wider variety of color options. Can I access multiple calendars at once? Yes, Google and Outlook both allow viewing and editing of several calendars simultaneously. Click the box next to each calendar on the left My Calendars menu to toggle on/off each calendar. Can I make a calendar that enables other people to schedule appointments? Select the start of your appointment time frame. In the top of the event window, click Appointment slots. Select the calendar you wish to place it on from the drop-down menu. Select the appointment duration: you can set it as one slot, or divide into equal increments. Click Edit Details and fill in any remaining details. Provide the Appointments link your audience. How do I set up Outlook to view my Calendar? You can access your Google Calendars in Outlook through Google's G Suite Sync for Microsoft Office (formerly GASMO). This program automatically synchronizes Outlook with your Google account, including Email, Contacts, and Calendar. For more information, see the UA Google Access section of the Email page. How do I access these calendars from my mobile device (iPhone, tablet, etc)? You can access your Calendars through your Google account, though specifics vary by device. Webmail access is available in your browser, or you can connect via various apps. Specific instructions for various devices can be found in the Mobile section of the Email page. How do I remove a calendar from Google? On the left navigation bar, locate and select the calendar you wish to remove. If you don't want to see it now but intend to use it later, click the box on the left to remove it from the calendars present. If you want to remove it entirely, click the arrow for the drop-down menu, and select Hide this calendar from the list. If I delete a repeating event, do I have to remove all events or can I just edit one? Google allows you to edit either a single event, or all the repeated entries. In Google Calendars, you can edit Only this instance, All following events, or All events in the series. In Outlook, you can edit the Occurrence or the entire Series, respectively. Can I get to shared calendars on my phone? Yes, you can connect to the same list of calendars on any supported device. Go to the Google Calendar for iPhone page to pick which calendars you want to sync with your UA Account (you will be prompted to log), then click save. Calendars won't appear right away, but will gradually appear within a couple minutes as background processes complete. The dialogue may expand asking for similar settings. Confirm your username and password are correct. If managing multiple accounts tap Calendars to sync to bring up complete list of accounts available. What is the difference between Google Drive and a Google Fileshare? Google Drive is a Google-provided tool to store, edit, and collaborate on personal documents online. UAS provides the Google Fileshare tool, which allows departments and group to control access to specific Google Drive locations from a centralized tool: Group Security Manager. Is there a limit to the size of content that can be placed on a Google Fileshare? No, there is not a size limit to what you can place on a Google Fileshare. Can I create new folders inside a Google Fileshare? Creating new folders inside a Google Fileshare is the same as in Google Drive. Click the New button in the upper left, and select Folder. 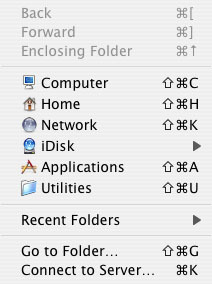 Enter the name of the folder and click Create. This creates a new folder inside the fileshare that shares the same access permissions. 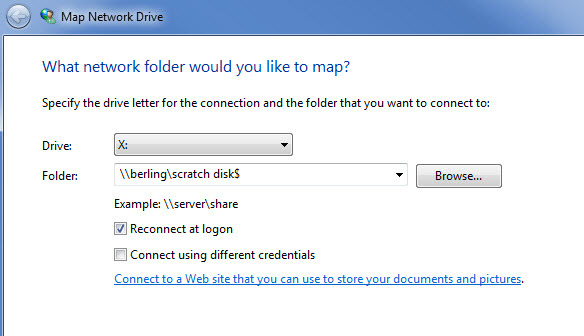 An automated process will change the Owner listed on the folder to match the fileshare's setting. Where are the files stored when saving them on a Google Fileshare? All files stored on Google Drive are saved to Google servers, not UAS servers. This includes Google Fileshares. Be aware of this when choosing where to save your files. What can and cannot be shared on a Google Fileshare? Google is great for sharing and collaborating, but it is not a good storage location for sensitive information. Consider if your document contains personal data or materials that should not be released to the public, in accordance to FERPA regulations. For more information, check out the Google Guidance document. How do I share a specific document in a department Google Fileshare? 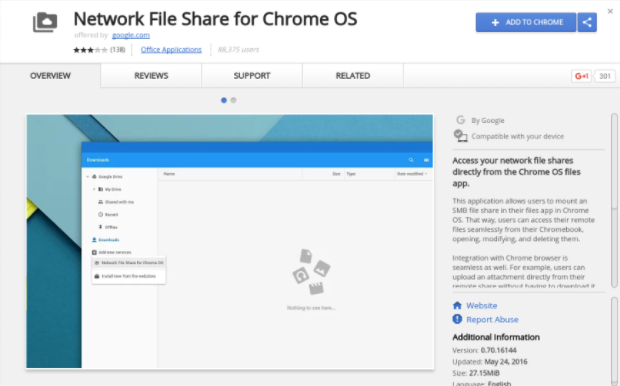 Everyone granted access to the Google Fileshare can view, copy, and edit documents. If you want to provide special read-only access to particular people not within the group, you can share using standard google sharing techniques. Is a Google Fileshare appropriate for a non-University affiliated group? 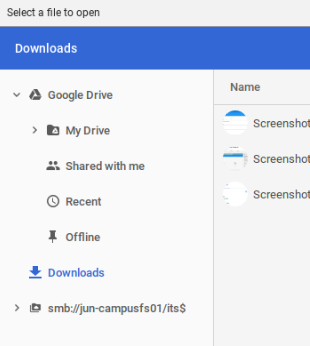 Google Fileshares are designed with current University groups in mind. Access is tied to University accounts, and not designated for outside use. 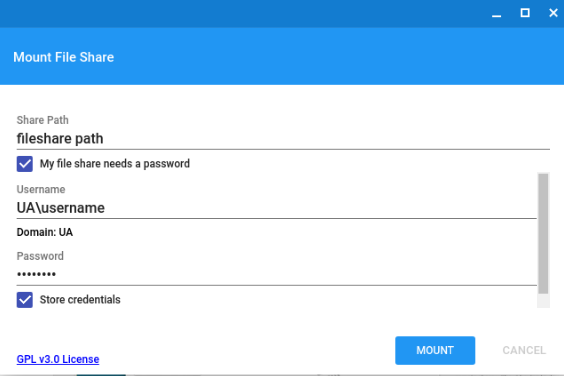 Instead, you can create and manage your own Google Drive folders which do not require authenticated access. How is access for each of these resources managed? Access is managed by adding and removing people from a group. This group access is managed by someone within the department through the use of Group Security Manager through UAS Online. What is the advantage of having a departmental resource vs sharing a personal one? Creating a Resource Calendar or Google Fileshare allows account access to be controlled from a central location. Multiple resources can be managed in the same location, or even the same list of people, and will update according to UA account status. How do I request these resources be created for my department? Fill out and submit the Google resources Request Form. The IT Helpdesk will contact you about your request. How can more than one person have manager power over a personal Calendar? You can grant other people direct access to your personal calendars. You can grant specific individuals various levels of control, from hiding all details to creating and editing all your events. How many managers are allowed on the same Resource Calendar or Google Fileshare? Administrator access can be granted to multiple individuals in Group Security Manager. Having several individuals as admin allows you to control the workload and cover availability. I have been given admin access, but can’t access the Calendar/Fileshare. How do I get in? Being granted admin access does not grant access to the content. From UAS Online, go through Group Security Manager and add yourself to the User list. Why can I see account expiration dates in Group Security Manager? What does this mean? Accounts are set to automatically expire after a certain amount of time. Every night, an automated process extends all active accounts by a day. As long as the account is still considered active, they will still have account access. For more information, check the Accounts page. How do I know if my computer has a wireless card or ethernet device? Most newer laptops have both, and nearly all desktops will have Ethernet. Check the specifications of your particular computer model. How can I protect my computer while it is on the network? You can update your operating system, install and update anti-virus software (you can even use the same security software as the UAS campus! ), and be cautious about programs from emails or the Internet. What kind of equipment is being used at housing? Error 403: VPN connection terminated locally by the Client. In this situation, you may see an error message similar to "VPN Connection terminated locally by the Client. Reason 403: Unable to contact the security gateway." This error is most commonly caused by the use of an incorrect or expired password. Try logging into another UAS tool such as webmail or UAS Online - if your password works in these locations, try the VPN again. If none of these locations work, use ELMO to reset your password. Error 427: Unknown Error Occurred at Peer. Though there are some explanations that this error may be linked to the existence of multiple styles of network connections, in our case, it is commonly that a password has expired. Please update your password at ELMO and try connecting again. I successfully connected, but the connection periodically drops. There are a number of places you can check to try to track down this issue. First, verify that the computer did not go into standby or hibernate. These can interrupt your network connection when the VPN client expects a constant link to the VPN server. 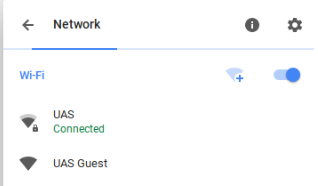 If wireless is in use, perhaps you have moved to (or are in) a location with low or nonexistent wireless signal, and the VPN might have dropped as a result. Further, it's possible a bad network cable or problem with the router or Internet connection could have caused this drop. How do I update to a new computer (and what is a build)? If you have an older computer that is not keeping pace with your everyday tasks, you can ask your department to purchase a new computer. The University of Alaska System has contracts with Apple and Dell that provide deals on our recommended hardware. Once your computer has arrived, you will need to fill out a Build Form requesting an employee virtual or employee non-virtual build for your new computer. With that completed, the Helpdesk will reach out to you to schedule a time when we can place the standard UAS software (or build) onto the computer, as well as any specific software you need. Windows and Mac computers are both supported by UAS. ITS will make every effort to place the employee build on departmentally purchased computers, but cannot guarantee that it will work with every device. The University of Alaska has contracts with Dell and Apple which allow us to purchase computers at a discounted price with enterprise level support. UAS ITS cannot guarantee support for other computer brands or those purchased from other vendors. Please visit the Office of Information Technology’s Current Hardware Recommendations webpage for Dell and Apple purchasing links. IT provides software support for Mac computers. While we do not have a Mac build, we can provide certain UA licensed software. For a list of software available please see the software catalog. Why don't we have an employee non-virtual windows 10 build? IT is processing the creation of an updated non-virtual build. It will be Windows 10 and include our latest licensed software. For a list of software on the current build, see the Managed Software page. What kind of programs can I install on my computer? The primary user of a computer is given full administrator rights on the machine. This means you have the ability to install any programs you have legally acquired. IT is able to install programs that we control the license for, and can assist you installing any additional software. How do I become an administrator on my primary work computer? When your computer is being built by our technicians, it will be assigned to an individual. This person, the primary user, will be granted full administrative rights to the machine. If there is no primary user for the machine, an administrator should be requested in the build request form. If you have been issued a computer by your department but it hasn't been rebuilt, please contact the Helpdesk. We can remotely grant you administrator rights to your primary workstation. From your on-campus phone, press the Messages button, or dial 5555. Follow the prompt, and enter your PIN, followed by the # key. From off-campus, or a personal phone, dial 796-5555. Press *, enter your 4-digit phone extension, followed by #. Then, enter your PIN, followed by #. You'll also receive an email notification when you get the email. This will include both an audio file and link to the Webmail Inbox: http://uas.alaska.edu/pub/voicemail. Just log in using your UA credentials. We recommend using Firefox, as it supports all functions. How can I update my voicemail passcode if I've forgotten it? The Unity Voicemail system can be access via the web utilizing your campus credentials**, so resetting the PIN is straightforward. You're done! Sign into voicemail with your new passcode. **For those who utilize a shared account (I.E. general shared accounts like Helpdesk, Financial Aid, or others) please contact the Helpdesk for assistance. How can I set an Alternate (Temporary) Message on my voicemail? How can I transfer a caller directly to voicemail? To transfer to a voicemail account, press the transfer button, dial asterisk+extension ('*6400' for the Helpdesk), and immediately press transfer again (if you wait, you will begin to hear the voicemail for the dialed extension). How can I increase the volume for playback on my computer? 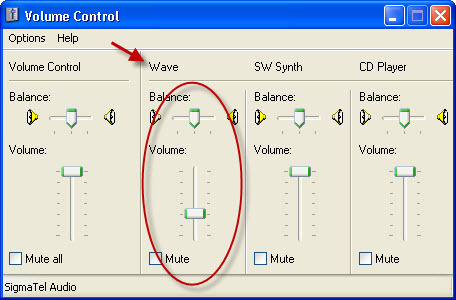 Some PC users have noted that even though the volume is turned up all the way that they still cannot hear the message well. To reach the maximum volume, double click on the 'Sound' icon near your clock (it looks like a small speaker). At the next screen you should see the system Volume Control (image below). Simply increase each slider to the maximum and try again. Likely, it will be the Wave slider that will make the biggest impact. If this does not increase the volume loud enough for you, remember you can still check your voicemail via your phone. Is there some type of phone tutorial available? Why yes there is! Take a look at our web worksheet for the functions available on your phone! How can I increase/decrease the volume of my phone ring when I am already on the line? Currently, the system default is to provide a quiet beep over the conversation through the handset. If you would like the second line to ring audibly on your phone set, it can be configured to do other things like ring once, ring, or flash. Use the Call Manager tool to configure your phone behaviors. Contact the Helpdesk if you need any clarification or assistance. How can I do a call-pickup of ringing phone? In the case that is too cumbersome, if you have a free line (button along the side of the phone display), it can be programmed to “speed dial” the PickUp functionality. When forwarding to an external line caller ID doesn't show correctly? With the way the phone system works, when the call is “redirected” it is, in actuality, your line calling out. So, it happens to be that the caller ID is correct, albeit misleading. Note: The new Cisco phones on campus can be fowarded to an external (non-campus) line, however, the behavior is essentially the campus line placing a call on the callers behalf so while you can tell that the call is coming from your campus phone, you will not be able to tell who is going to be on the other end of the line. We have a vacant position/phone, how can we be sure that we are receiving calls to that line? First and foremost: call the line! Depending on what happens with your call, you can then know how it’s currently acting, and subsequently make requests to assure that it performs as desired. These changes can be made by your telephone manager. It’s likely that you’ll want to change which voicemail account is affiliated with the line. Additionally, you can choose to forward the phone using the ‘CFwdALL’ soft button on the phone. Who is my "Telephone Manager"? In most cases your department Cost Center Clerk is the point-person for adjusting phone settings through the Telephone Manager. If you cannot determine the right person in your department to talk to, please contact the Helpdesk to find out which staff are affiliated with a particular phone line. Is there a way to retrieve or un-delete a message previously removed? Deleted voicemail and email messages are moved to a folder called “Deleted Items” when removed using the phone, Outlook Exchange or webmail. When that folder is emptied, messages are no longer affecting the server quota. There is a mechanism in place whereby messages that have been deleted and purged are briefly available through the options area of the webmail when accessed with Internet Explorer through OWA "Premium". When listening to voicemail, it speaks very FAST / SLOW. What gives? The Unity voicemail system has the ability to change the speed of playback. Why is the red light on my phone still on? The red voicemail indicator light on your phone is connected to your voicemail inbox. This can be accessed online in the Cisco Web Inbox. You can also call in my pressing the Messages button on your University phone, or dialing 5555. These two inboxes are tied, changes to one will affect the other. Once all voicemails have been listened to the light will clear. Voicemails will automatically be deleted after 14 days, but will remain in your email. Listening to the voicemail through the email notification will not affect the red light. How do I get to my ePortfolio? Sign into UAS Online and click the View Portfolio link on the front page. Go to any UAS Online course and click the Portfolio link on the navigation bar. Click on the Portfolio: View link from a class list. This link will only appear once content has been added to a portfolio for that course. How do I make a blog (web log)? Choose a page in your portfolio to have the blog, then go to Manage Page and Content Setting, finally check the box to Display a weblog. How do I restore an item that has been removed from a page? Go to the page, click the Manage Page link in the upper right. In Content Settings: Current Items, click Browse. You will then see a list of all of the items that have ever been added to any your portfolio pages. Find the item that was removed and click the Add button. How do I make thumbnails of my images for posting in my portfolio? To create a thumbnail when uploading your images, in Options for Images, choose Version to Display = Small and Click-to-View = Enabled. When the attachment has been added, preview your posting to see how it will look. The initial image will be small, and when someone clicks on it, a new window will open with the original size of the image. What is a forum, and how do I create one? A forum is a place on an ePortfolio page where you and others can engage in discussions. To add a forum to any portfolio page, simply go to Manage Page, then Content Settings and Forum Settings, and check the box to Display a Forum on this page. How can participants in my forum create new topics? As explained in the Forum Settings, "People with General Access can view content and Reviewers can post." By default, for course portfolios, all participants in the class are reviewers. For non-course portfolios, no one is a reviewer. To add a reviewer go to Manage Page, then Access Settings, and put the usernames of the people you want to review in the Reviewers text box. If I put stuff on my portfolio, can I use it in other portfolios? Uploaded items added to a page can be shared between pages. Pages in the portfolio system can be copied within the system. What are others doing with their portfolios? From the UAS Online main page, click the Browse Portfolios link. You can check out what's new, what's popular, or search for something interesting. As a participant in a course, you will also be able to view and comment on the portfolios of your fellow students from the class list. Can anyone look at my ePortfolio? By default, portfolios pages are viewable by others but the person would need to know how to get to it. In the "Manage Page" option, you can restrict the access settings. How do I make a page of my portfolio so anyone can find it? Within your portfolio, choose Manage Page and click the Publish button. It's a good idea to give your page a good title and description, otherwise it will be difficult to search for. How do I create an easier web address for my portfolio? Go to PUB (Personal URL Builder) at http://www.uas.alaska.edu/pub to create an easy address for any of your sites. My invitees report that they are prompted for a password when trying to access my portfolio, how can I fix that? By default all portfolio pages are viewable by anyone, so double-check the following setting. Go to Manage Page, Access Settings, and set the General Access to unrestricted. This will ensure that anyone you invite will be able to view the page. I’d like to share pictures with my family, how can non-university people look at my page? Portfolios are accessible by anyone with access, so they will be able to view it. Send them a method to access it, such as a custom link or searching instructions. A virtual machine is a customizable computer designed to be accessed from a variety of locations. It works in a similar manner to non-virtual computers, but is located on UAS servers. Employees can access their virtual machine on any computer with a VMware license and an internet connection. How is a virtual machine different from my current university computer? It differs in several ways: virtual machines are independent of hardware, VMware can be installed on any computer that follows our license agreements, and they offer greater flexibility than physical machines. ITS also has the ability to add or reduce the server's memory, add or remove a processor, add a virtual disk, or increase an existing disk size by shutting the VM down and changing its settings. There is also a snapshot feature that lets you save the state of the server in case you need to restore it later on. What are the benefits of using VMware? There are many benefits to using VMware. Virtual Machines are independent of hardware. They are accessed through VMware, which can be installed on any computer that follows our license agreements. Consistent work environment across multiple devices on one profile. VMWare is fully compatible with older machines that may independently have issues with newer software. ITS can rapidly deploy a common, supported desktop environment across the network. Updates can be managed centrally, ensuring that all virtual computers are consistently up to date. Central management of each standalone workstation across the entire virtual environment. Users connecting to a virtual desktop can have full access to all features of that VM without impacting the other virtual desktops or the host server. What are the limits of virtual machines? Virtual machines are not for everyone. If your job requires you to travel or you are frequently away from a stable internet connection, virtual machines are not well suited for you. An internet connection is required. Loss of internet results in disconnection from your virtual machine. This results in no loss of data. If your job requires you to travel or you are frequently away from a stable internet connection, virtual machines are not well suited for you. Audio output via HDMI is currently unavailable. This is primarily a concern for folks making frequent presentation or lectures. Hardware settings (like battery) can't be changed from the virtual environment. This limits your external customization (but you still have control outside of the virtual space). Virtual machines do not recognize internal disk drives. You will need to use an external disk drive. External monitors may require additional configuration. What operating systems does VMware support? Horizon View can be installed on most versions of Windows, Mac OSX, and Linux. I have a Mac. Can I get a virtual machine? Yes, we can create a virtual machine for you. It will be a standard Windows 10 Virtual Machine; we do not currently have a Mac OS virtual environment. Any VM we create will be accessible from any university-purchased computer with VMware installed, Macs included. Could I access my computer from other devices? Yes! VMware software can be run from a wide variety of devices. UAS is licensed to access our virtual machines from any UAS owned or leased Microsoft or Apple computer. Why doesn't my webmeeting open? This most often occurs when your computer doesn't recognize what program to open your webmeeting file in. You will need to open the "meeting.collab" file with the Blackboard Collaborate Launcher. Blackboard will present you the option to download this if it detects your computer doesn't already have it. You are also presented with a different option to download it even if Blackboard detects that you have it. What is the recommended internet speed for my webmeeting? Blackboard Collaborate webmeetings are an active connection between you, the instructor, and your entire class. If you are unsure if your internet connection will be capable of handling the webmeeting, you should check the system requirements. Most classes use Blackboard Collaborate Classic, which requires at least 28.8 kpbs. You can see Blackboard's full requirements in their Knowledge Base article. If your instructor uses Collaborate Ultra, there isn't a set minimum value. Instead, it's based on what material is being presented by the Instructor. For more information, see Blackboard's Knowledge Base article. I click on the "Webmeeting" link in my course, but nothing happens. If you are using Safari or Internet Explorer as your web browser, they may not tell you that your Collaborate session file has been downloaded. Open the "Downloads" menu in your browser, and you should see a file called "meeting.collab". Double click on that file, and the session should launch. Internet Explorer users may also want to try "Why doesn't the WebMeet link open a session?" listed below. When trying to connect to a webmeeting, I get the message, "Access Denied, session is not valid." This problem usually occurs because an invalid .collab file is used to initiate the Collaborate session. Usually this can be solved quickly by exiting from the Collaborate window, and trying to reconnect from your course site. When trying to connect to a webmeeting, I get the message, "this application is from an unidentified developer." Mac users will receive this message, and can get around it by going to the Apple icon > System Preferences > Security and Privacy > General tab. Click on the lock icon in the lower left corner and enter in your administrator credentials for that computer. Then, where it says "Allow apps downloaded from..." select "Anywhere." Why doesn't the Webmeet link open a session? A number of people are being caught by the security in Internet Explorer. After clicking the WebMeet link, there may be a small yellow bar that appears above the navigation bar for the course. It indicates that the download was blocked and to click here for further instructions. Click the bar and choose Download File... Internet Explorer will then return to the course homesite. Click the Webmeet link again and it should then open the session. I keep getting the following error when I launch my webmeeting (.collab file) on my Mac: "Could not launch Java Web Start"
This error occurs because of a conflict between Mac OSX and the Blackboard Collaborate Launcher. The full text of the error is "Sorry, we could not launch your session or recording due to a problem with Java Web Start (which comes bundled in the Collaborate Launcher). Please open the link in your browser again and, if that does not resolve the issue, delete the existing Collaborate Launcher and download it again." The solution to his predicament is to access your webmeeting using an alternate version of Java Web Start. Right click on .collab and click File > Get Info > Expand the "Opens With" section. Select Java Web Start and click okay. This should set all .collab files to Always Open with Java Web Start. This will change your settings to always open every new webmeeting in Java Web Start. Can I disable the Information Bar prompt when starting Collaborate? To turn off the Information bar for file downloads, scroll to the Downloads section of the list, and then, under Automatic prompting for file downloads, click Enable. How come my powerpoint file won't load? Some versions of Office on Mac won't load a powerpoint file. The workaround is to save the slideshow in a folder as a jpg, then use the load button and select all to load the entire slideshow as jpgs. Why can't I open Powerpoint in Webmeeting? If you received the eLivePPTConverter6 Error, please close out of Powerpoint prior to uploading the file to the webmeeting. This can also be caused by Articulate or Turning Point plugins added into PowerPoint.